Tattoos are produced when pigment is implanted into the skin. When a tattoo is placed either by an amateur or a professional, the pigment concentrates at various levels in the dermis. Tattoos that have been professionally placed have increased pigment density compared to amateur tattoos. 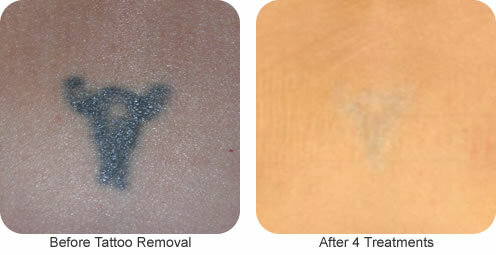 With the use of Q-switched lasers, tattoos can be treated to remove this pigment from the skin. What are tattoos made of? Tattoo pigments are composed of mixtures of metallic salts and organic dyes. Although tattooing is widely practiced, the FDA does not regulate the manufacture or use of tattoo pigment despite the risk of infection, allergic reaction, scarring, and metal toxicity. What types of tattoos can be treated, which tattoos respond the best, and how many treatments will I need? Black amateur tattoos generally respond well and usually lighten significantly with 3 to 6 treatment sessions. The response of densely pigmented, multicolored professional tattoos is far more variable. Six to twelve treatments, and sometimes more, may be required to achieve improvement. The treatments are to be performed at 6 to 8 week intervals. Incomplete removal is always a possibility. Green and yellow colors in particular can be resistant to treatment. Prior to the procedure, a topical or injectable anesthetic will be used for comfort control. The procedure itself takes only a few minutes. A day or two after the procedure, the treated area will form a crust, possibly blister, and slowly heal over the next 1 to 2 weeks. The use of a soothing ointment after the procedure promotes improved and more rapid healing.